EURJPY has been steadily rising this week to reach a one-month high of 125.45 on Wednesday, but the RSI has yet to show strong momentum above its 50 neutral mark for the market to pick up steam. The Ichimoku indicators back this view as well since the red Tenkan-sen and the blue Kijun-sen lines appear to be flattening. Yet, with the 20-day moving average (MA) changing direction northwards, the pair may keep trending higher. In case the pair corrects to the upside, nearby resistance could be found around 125.80, which is the 50% Fibonacci retracement of the downleg from 133.21 to 118.57. Slightly higher, the area between 126.38 (50-day MA) and 126.61 should attract some attention since the price has rested within these barriers in the past. Steeper increases may also face a wall around the 61.8% Fibonacci of 127.53, which the bears were unable to break in November. Moving down and below the 20-day MA currently at 124.52, the region encapsulated by the 38.2% Fibonacci of 124.13 and the previous low of 123.38 could halt bearish actions, while lower down, the 122.38 trough registered on January 4 and the 23.6% Fibonacci of 122 could gather some interest before the focus shifts to the 121 psychological level. 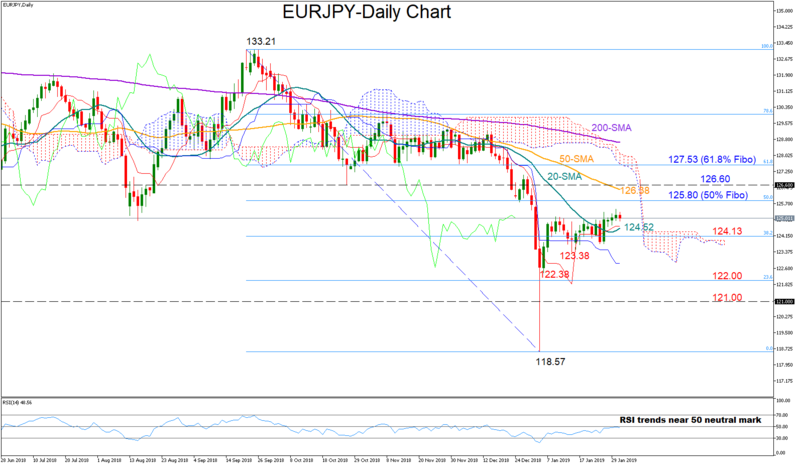 Turning to the medium-term picture, EUJPY maintains a bearish profile after a close below the 126 handle. Unless the 50-day MA corrects its bearish cross with the 200-day MA, a bull market is seen a long distance away.